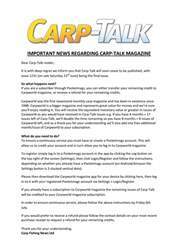 This week’s issue of Carp-Talk (issue 1061) is available to download now. Duncan Newton lands his second and third forties of the year from Darenth Big Lake. 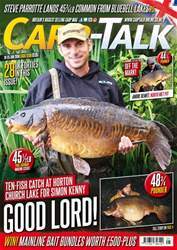 Gary Garnham nets 44lb 11oz Stella from Nunnery D Lake, while Chris Butler gets his hands on Moonscale at 43¾lb from Yateley Match Lake. 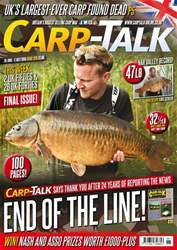 Ben Hervey-Murray has a guide to selecting the right main line, David Fuidge gets his spring campaign under way, and Haydn Hoskins’ revamped plans pay off nicely. 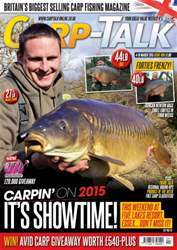 Products from Nash, Avid and Gardner go under the spotlight in Trade Talk, the Nash monthly winners are announced, and we have £540-plus worth of Avid Carp products to give away.